Favorite food: Anything, mostly food and Toilet Paper. Favorite toy: I have so many toys, but my favorite is my squeak ball. Favorite activity: Zooming around the house, chasing Bear, (he really needs the exercise) Watching TV w/ mom, playing in the yard, going out the doggie door and then coming right back in. It's a real talent. 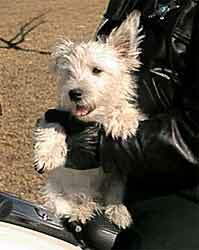 Riding on the motorcycle, having my tummy rubbed, but NOT brushing, Patroling the compound. Most embarrassing moment: I found this dead bird in the yard, and I just knew that Mom would love to have a present, but she really wigged out and then threw it away. She even had the nerve to tell me "NO" and "BAD BOY". See if I bring her anymore presents and put them in bed with her to wake up too. Most trouble I ever got into: Back to the dead bird...I also like to shred t-paper into as many pieces as possible, I chew shoes, but only one of each pair. Gee, you'd think they would appreciate my no being selfish..
My favorite friends: Daddy (Toby) Mommy (Molly) and Bear (the rottie) I also like Josh & Joey, my human brothers. They have lots of stereo equipment in their rooms and I love music.